The economic outlook for job seekers in Sacramento has been lackluster at best for the past few years. Recovery from the ’08 financial crisis has seemingly taken the path of most resistance, as evidenced in the fact that our nation’s recent attempt at economic recuperation has been one of the slowest in recorded history. However, a recent series of economic forecasts has economists and Sacramento job seekers alike more optimistic now than during any other period in the past seven years. Recent economic gains across a variety of industries has the entire state booming with employment growth. In 2014, employment among California State residents grew by 2.2% — the strongest employment growth California has seen since 2000. 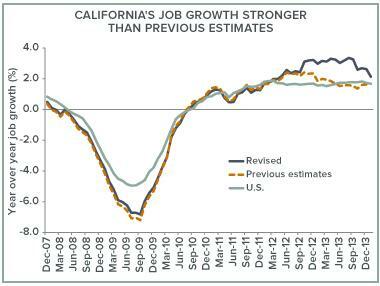 In total, California has added more than 5.1 million jobs to the economy since mid-2009, at the height of the Great Recession. Furthermore, one of the most consistent criticisms of what some have coined the “Great Recovery” has been the overall average wage growth, which is finally increasing. Californians have enjoyed wage growth of over 28% between 2009 and 2014 (latest year available), which is well ahead of the overall U.S. inflation rate.